Coconuts or cocos nucifera are fruits that come from the coconut palm, also called “the tree of life” because it is a source of food and medicine. They are high in fiber, minerals and nutrients. Coconut juice and meat are very delicious and refreshing especially when chilled. It is usually served as a drink on a warm day while the meat and its milk are added to desserts or other dishes. 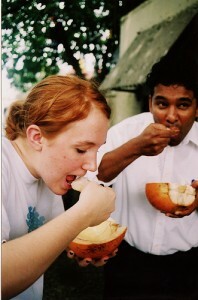 It is only recently that we started appreciating coconuts for its healing and health properties. Recent studies have discovered and proven its medical wonders. This is why more people use it for cooking and even cosmetics. Apart from strengthening the immune system, coconut oil can also aid in healing wounds and bruises. When applied, it protects the area from dirt, bacteria and fungi that can infect it. It also contains a lot of calcium that keeps bones and teeth healthy. Coconut oil can work wonders by aiding better digestion and it can even be useful for weight loss. It increases the absorption of nutrients and it helps speed up metabolism. A regular intake of coconut oil also controls blood sugar and it improves insulin secretions. It is also known to prevent kidney and gall bladder diseases; even dissolve kidney stones as well.